Sharon has spent hours and hours researching our kitchen remodel. 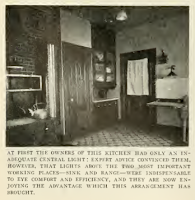 We really wanted to redo the kitchen consistent with the character of our 1912 Craftsman, but with modern appliances and conveniences. Sharon also wanted to figure out whether we could use stained woodwork in the kitchen because she really didn't want a white kitchen. 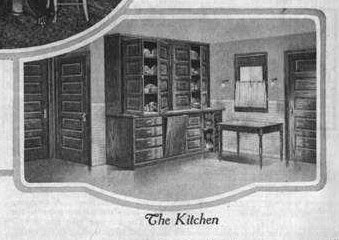 While her research did find that (probably) most kitchens in the early 1900s were white—it was not unheard of to have stained wood kitchens. 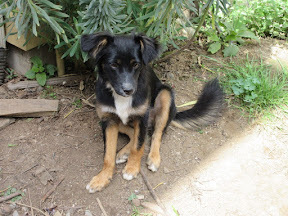 For others who also want to convince themselves that it's OK not to go with white, she thought she should share some of her picture resources. 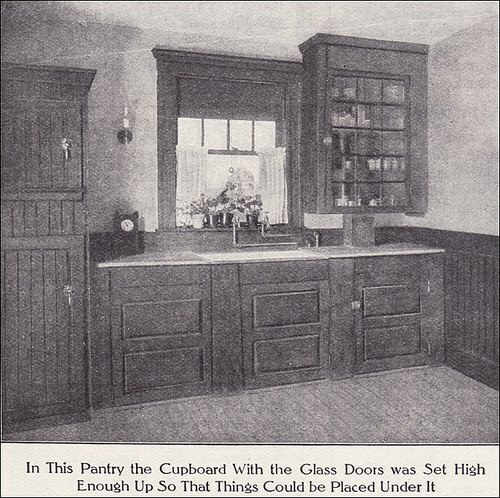 This image is a picture of a Kitchen Cabinet from the 1914 Aladdin House Kit Catalog (page 90). 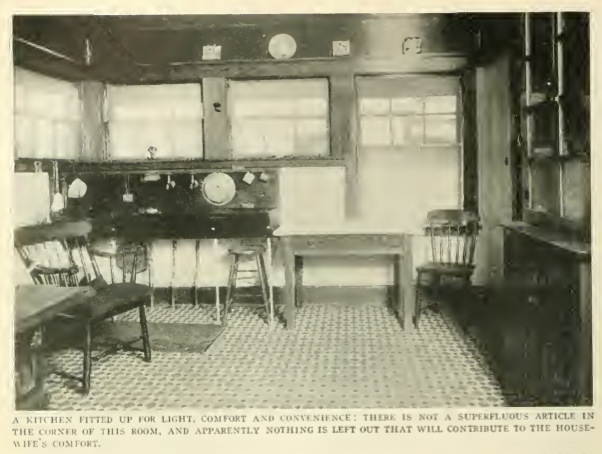 This is another kitchen from 1912. Apparently the original source for this photo was from "House Beautiful." Sharon grabbed the photo from a set posted at Flickr by American Vintage Home. 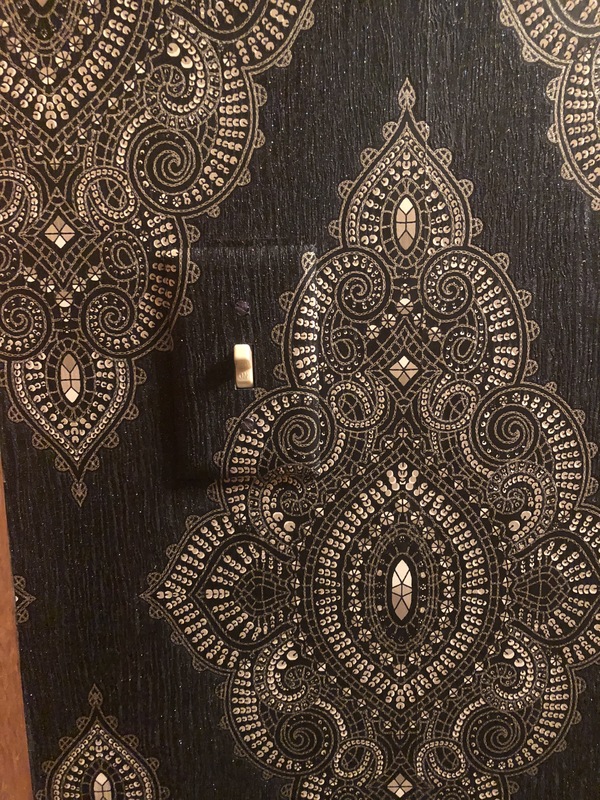 This image is from the Sears Kit House Catalog. This particular house was called The Marina and was sold in 1917 to 1921. This is a photo of a kitchen pantry dating from 1911. Apparently the original source for this photo was from "Ladies Home Journal." Sharon grabbed the photo from a set posted at Flickr by American Vintage Home. Found this first (left) kitchen in the Craftsman Magazine in the July 1914 issue and the second (right) kitchen in the April 1915 issue. Unfortunately, kitchen (and bathroom) pictures are few and far between in the Craftsman Magazine, but they did include a few and the kitchens were not all painted. 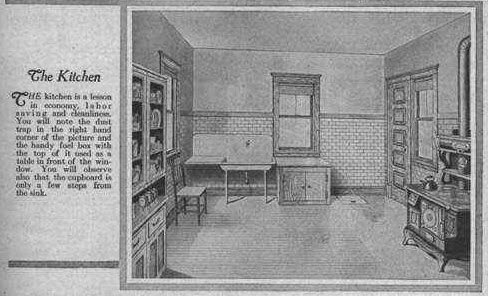 This unpainted kitchen was grabbed from a free, period ebook titled "Inside the House of Good Taste" by Richardson Wright published in 1915. 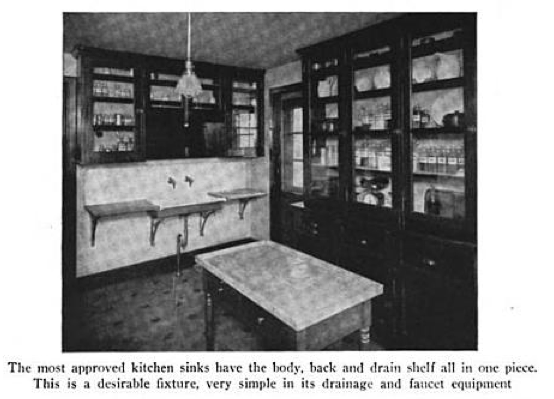 They were talking about the sink, but Sharon was excited about the unpainted woodwork in the rest of the kitchen. In addition to internet resources, Sharon heartily recommends Bungalow Kitchens by Jane Powell as a starting point in your own bungalow kitchen remodel research. And if you're more concerned about the budget and less about historic accuracy, The New Bungalow Kitchen by Peter Labau is also decent. Though maybe check it out of the library first before you invest in a copy, just in case the ideas don't suit you. 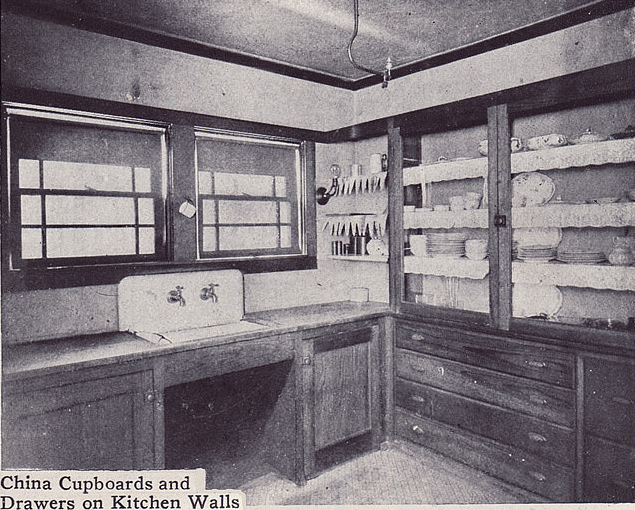 Thank You for posting these historic and inspirational pictures of kitchens, kitchenware, appliances used in that day, etc. So helpful! 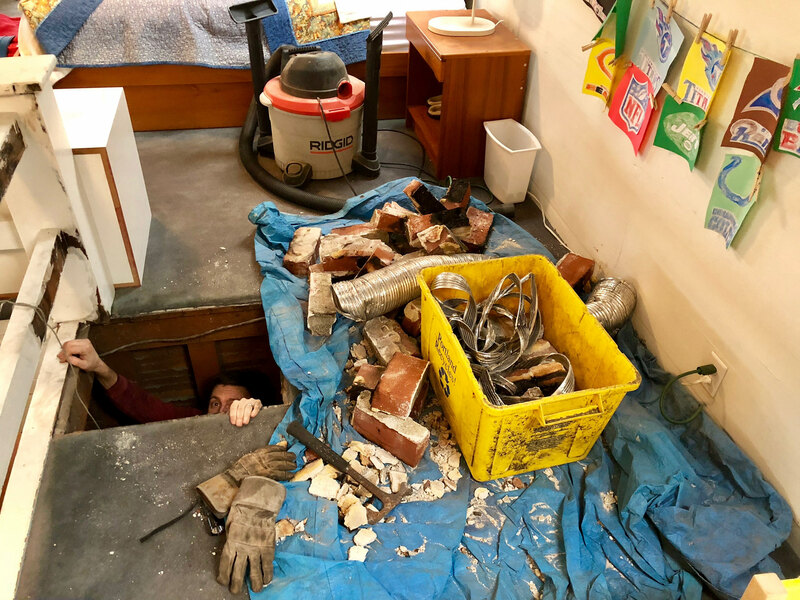 People who want to decorate or do an authentic restoration in an old home thank you very much!